Editor's Note: Dr. Miller has translated several classical Indian texts from Sanskrit into English. In the last issue we published a seminal text of Advaita Vedanta - Drg-Drsya-Viveka: An Inquiry into the Nature of the Seer and the Seen. We now bring you Richard's translation of Patanjali's Yoga Sutras as a four part series along with his rich insights and incisive commentary. The Yoga Sutras are comprised of 196 terse aphorisms, which are attributed to the sage Patanjali (Sanskrit: Grace-filled), who recorded them around 450 BCE. While Patanjali’s true identity is lost to antiquity, myths abound as to who he really was. 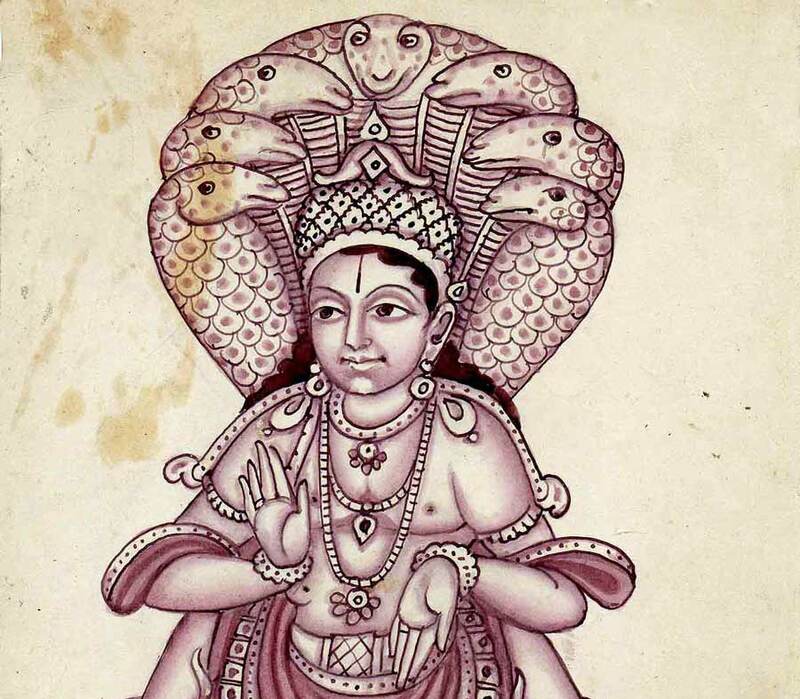 Patanjali is reputed to have been an incarnation of the ser­pent God, Ananta (Sanskrit: Infinite) and is depicted in statuary as possessing a body that is half human and half serpent. Statues often portray him as sitting absorbed in meditation, with hands folded in Anjali Mudra, bestowing his blessing upon all who approach him seeking enlightenment through the teachings of Yoga. freedom from the material world (half-coil). sword, which represents discriminative wisdom that cuts through all misperception, doubt and ignorance). the author of the Yoga Sutras. Confusion as to the deeds that Patanjali actually performed abound. One controversy concerns the fourth pada, or chapter of the Yoga Sutras, as its style, content and length are different from the first three chapters. While the first three chapters present their content in a leisurely and non-dogmatic manner, the fourth chapter, by contrast, conveys its message in a more insistent manner. Also, one sutra in particular, IV 16, appears to have been lifted from Vyasa’s commentary on Yoga, and in traditional renditions, both the third and fourth chapters’ end with the word ‘iti’ (Sanskrit ‘thus it is said’), which is a traditional way of ending a Sanskrit text, thus suggesting that there are two ‘The End’ to this one book, thus lending confusion as to whether the fourth pada was an addition by a later author. That said, all four padas taken together deliver an interwoven tapestry of outstanding homogeneity and consistency. 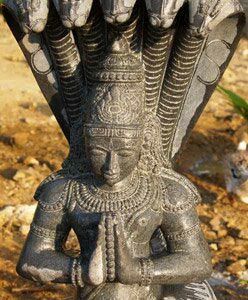 Yoga existed before the time of Patanjali, who appears to have been of the Shramana tradition (wandering forest yogis) and was a synthesizer of the various streams of Yoga that existed during his lifetime. Many Upanishads, recorded as early as 1100 BCE, make unequivo­cal references to pranayama, asana, and yogic dis­ciplines. And by the time of the Mahabharata (written around 400 BCE and conveying events that took place much earlier in the 8th and 9th centuries BCE), both Samkhya and Yoga are well-established systems of spiritual inquiry. Patanjali, then, appears to have come much later, compiling in his Yoga Sutra trends that were found in the much earlier streams compiled by Kapila (Samkhya) and Hiranyagarbha (Sanskrit: Golden Womb) from which all Yoga teachings are thought to be derived. The Yoga Sutras of Patanjali describes the path, means, description, and realization of our most essential nature. Based in the dualistic philosophy of Samkhya, each of Patanjali’s 196 sutras presents us with a means for realizing our essential nature by way of our differentiating what changes (prakriti -nature) from what doesn’t change (purusha-essence). Patanjali presents us with a dualistic perspective, based on its underpinnings of Samkhya, that results in our freedom from the various changing movements of body, senses, mind and world, and the realization of our essential non-changing nature. 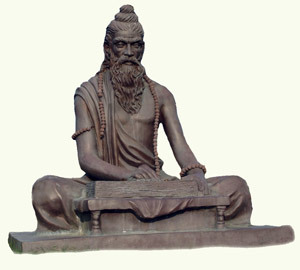 Even though some schools of nondualism dismiss the teachings of Patanjali as a lesser dualistic perspective, when viewed within the comprehensive teachings of yoga that include Advaita and Kashmiri Nondualism, Patanjali actually forms the first foundational stone in spiritual understanding that ultimately culminates in our awakening into the fullness of the nondual realization that embraces everything as an expression of essential nature. From this perspective, Patanjali offers us a first ‘way station’ in our travels towards our full and comprehensive awakening, a first blossoming in our flowering into freedom. 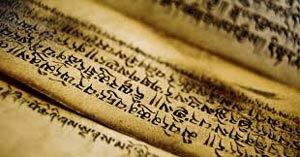 When reading Patanjali, keep in mind that each sutra is a condensed and pithy statement that contains multiple meanings, as each Sanskrit word can be defined in a variety of ways. For instance, the word nirodhah, which appears in the second sutra and defines the nature of yoga, can be translated as either a verb (‘to still’) or a noun (‘stillness’), or both. Knowing this enables us to fully comprehend the depth of understanding that Patanjali offers us. It’s also important to contemplate each word within both the context of the sutra where it appears, as well as the sutras that come before and after. Each word can be likened to pearl on a strand (sutra). Only by understanding the entire strand, or text, are we truly able to understand a particular word or sutra that appears in Patanjali’s presentation. Patanjali’s treatise is comprised of 196 pithy statements or sutras, which are offered in groupings of one or more sutras. Each grouping defines a particular topic, or piece of the puzzle of awakening. For example, the first four sutras of chapter one define what yoga is. Reading each sutra without understanding the particular grouping within which it appears can lead to confusion. Therefore, it’s important to first understand the topic that a particular grouping of sutras is addressing before diving into the individual sutras that comprise the grouping. In my interpretive translation of Patanjali, The Flowering of Freedom, I offer you the four chapters of Patanjali’s Yoga Sutras, as well as the groupings that appear within each chapter, and questions that students may have been asking of Patanjali back in 450 BC, which led him to unfold this timeless treatise on the nature of reality, the ending of suffering, our liberation and freedom from misperception, and the realization of our essential nature. Now that you are a sincere seeker of truth, free of preconceived notions and possessing the right disposition of sincerity, faith, and heartfelt interest, you are ready to hear, receive and contemplate the essential teachings with regards to attaining trueliberation and freedom from the misperceptions that otherwise distract your attention from truly understanding your essential nature.Now begins the communication, description and instruction regarding the right path, means, and realization for liberation and freedom with regards to the distinction between what it is that is ever-changing (prakriti) and essential nature that is ever-new, fresh and vital, yet is never-changing (purusha). What is Yoga, and when does yoga happen? Yoga is when we realize and abide as our essential nature—stillness—that is without movement, whether the mind, as the movement of thought, is in movement or is not in movement. The word ‘yoga’ implies many possibilities. This first chapter on the nature of absorption (samadhi) clarifies how yoga is to be understood in this particular treatise by Patanjali. Yoga, for Patanjali is our ability to remain absorbed without distraction, wherein the mind has ceased identifying with the waves of thought, so that the underlying stillness of our essential nature is recognized. From this perspective yoga arises when we realize the truth of our natural state of timeless stillness, being and awareness. Yoga is therefore ultimately beyond samadhi as a state. Yoga ultimately entails awakening into our ‘open eyed’ (sahaja) or nature non-state of being-awareness, which is uncaused, steady, always present and unbroken. Patanjali understands the dilemma we face at this point, as well as the two types of seekers that sit before him. He gives both direct (for those who are ready) and indirect answers (for those who need more time to ripen) to the question as to what brings true freedom and happiness. The direct answer he gives in this sutra is that our true state is unbroken and uncaused. All that needs to occur is to see life as it is, without anticipation or expectation, and to recognize the underlying stillness that is, and has always been, present. In this open-eyed seeing discriminative wisdom arises as to the nature of, and difference between, the seer and the seen. Patanjali also provides an indirect answer for those who do not directly perceive this simple truth. For these seekers he recommends an eight-fold path (ashtanga yoga), which purifies the mind, dissolves misperception, and gives rise to discriminative wisdom, so that direct understanding may be perceived. Many names have been given to this realization of yoga: non-conceptual understanding, consciousness, infinite, God, awareness, being, mystery, or essential nature. While I like the word ‘mystery’, as it gives the mind nothing to hold onto, for the sake of my writings, and in keeping with Patanjali, who uses the term purusha, I’ll refer to ‘this’ that is beyond name and form as ‘essential nature’. This essential nature that we truly are is not the result of any action. It is what we already and always are being. Essential nature is recognized when the fluctuating waves of the mind are recognized to be arising within the underlying essential nature, or stillness, that is the ever-present background of all movement and non-movement. Yoga happens when identification with the fluctuating waves of our mind ceases, and the radical understanding dawns that we are ineffable stillness, which is always present, which is independent of thoughts being present or absent. What happens when the realization of our essential nature arises? Then , when Yoga is, essential nature rests knowingly in and as itself. There is no longer confusion or identification with the movements that arise within the mind. Essential nature is realized as always present, whether the mind is in movement or is still. When yoga happens, essential nature is recognized as always present. There is no longer transference of self-identity to the mind, body, senses, etc. The movements of the mind (vrittis) have ceased to be identified with. What happens when one does not reside knowingly as essential nature? At other times, when yoga is not , the mind is busily occupied with its own movements. Because of this there arises confusion, misperception, and identification by the mind with its own movements, which gives rise to distorted understanding. A movement of thought is mistakenly identified as a seer and the real seer, essential nature, remains hidden behind a veil of misperception and mistaken identity. At other times, when yoga is not realized, the true nature takes on the appearance of the thoughts, or waves, of the mind. The view of Samkhya–Patanjali unfolds in a number of realizations. 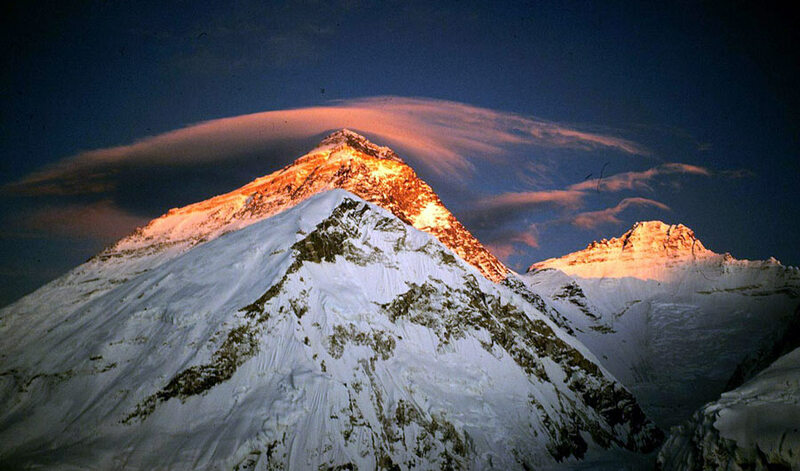 Essential nature (purusha) is understood to be separate from the movements of the mind and nature (prakriti). A modification of nature (prakriti), the mind (manas), gives rise to the ego-I thought (ahamkara), which gives rise to the sense of ‘me’ or ‘mine’ (asmita), which is falsely perceived by the mind as the seer. The true seer is essential nature (purusha). Mind gives rise to the senses. Senses give rise to their objects, whereby name and form appear. The mind, identified with the senses, their objects, and the ego-I thought remains unaware of essential nature. Through yoga, objects are recognized as movements arising to the true seer, essential nature. The recognition of the changing nature of objects gives rise to discriminative wisdom (viveka-khyati) of the difference between these changing objects and the true unchanging seer. Through unbroken attention, discriminative wisdom arises that this seer, as ego-I is, just another object. Then the seer, itself, becomes an object of attention. Through unbroken attention wisdom arises as to the nature of the true seer (purusha), and the true seer abides in and as its own nature, separate from the ego-I seer (ahamkara-asmita) of nature (prakriti). Freedom (kaivalya) of the difference between the true seer, essential nature (purusha), and the false seer (prakriti) arises. The recognition is present that essential nature (purusha) always is, separate from nature (prakriti), which also always is.